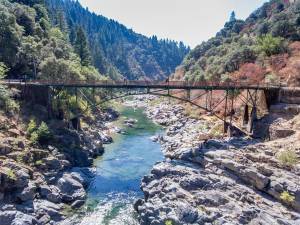 May 25, 2018 – Edwards Crossing Bridge carries traffic on North Bloomfield-Graniteville Road over the South Yuba River. Originally constructed in 1904 and last rehabilitated in 1989, it is one lane and load restricted, affecting emergency response and accessibility at the bridge. The foundations have been partially eroded from river flows, the metal railing and timber decking have aged, and the lack of certain design elements could expose it to future failure. A project to replace or rehabilitate the bridge is fully funded through the federal Highway Bridge Program (HBP). In late 2017, County Public Works staff sought public input on potential bridge rehabilitation and replacement options during a town hall meeting, an online survey, media releases, meetings with stakeholders, and dissemination of an informational brochure. The public and key stakeholder groups, including South Yuba River Citizens League (SYRCL) and the Nevada County Historical Landmarks Commission, overwhelmingly agreed that Edwards Crossing Bridge is an important asset to the community historically, aesthetically, recreationally, and economically because of the tourism generated by these qualities. Respondents were generally opposed to demolition or any other changes that would result in a loss of integrity to the bridge’s key assets. At the same time, there was also a strong majority of responses from the public and other stakeholder groups, including the Nevada County Fire Safe Council and the jurisdictional fire agencies, which favored building a new bridge that would meet modern emergency access and safety standards, as well as enhance the recreational access to this popular crossing. In response to public input, the County has been working to further develop project alternatives that would meet the needs of the community. These include a rehabilitation option and two options to construct a new bridge and utilize the existing bridge as a pedestrian- and bicycle-only bridge. The County is in the process of working with State partners to assess the feasibility of a preferred project alternative that would restore the existing bridge for pedestrian use only, while constructing a new two-lane bridge that meets all current safety and design standards approximately 1,000 feet upstream of the existing bridge. The County expects to receive a response from the State by fall of 2018. County staff is tentatively planning a summer workshop to update the public on these options and solicit feedback from the public. Additional notices will inform the public of a future meeting date and location. The public is strongly encouraged to submit any comments or questions throughout this process about the project by contacting Jessica Hankins, Public Works Project Manager, at (530) 265-1254 or Jessica.Hankins@co.nevada.ca.us.